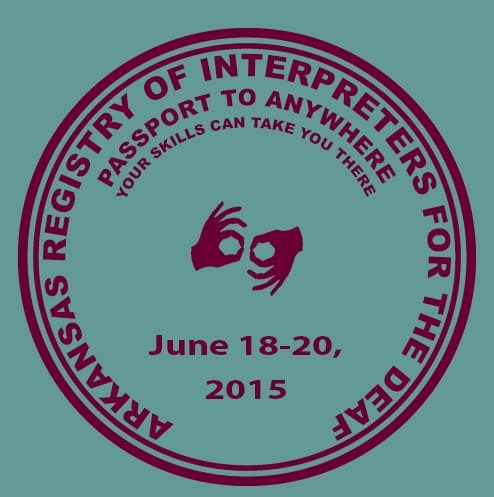 College students in Arkansas are invited to enter the Arkansas Registry of Interpreters for the Deaf (ARID) 2017 Biennial Conference Branding Design Contest. The winning documents will be used as the symbol of the conference and will be featured on web and print materials. The winning artist will be awarded $150. There is no entry fee for this competition. The deadline for submission is 11:59p on Wednesday, June 1, 2016. Documents must submitted online through the form below. The theme of the ARID 2017 Biennial Conference is “Interpreting: It’s a Team Sport!” and our official hashtag for this event will be #teamARID. Our conference will be held June 9-10, 2017. We invite participants to create team sport-oriented designs. All submissions should include one logo file and one letterhead file. incorporate our branded color (hex code 005640). Artists are invited to use this color as the main color in the logo or as an accent color and are not restricted in regards to what other colors or how many other colors the logo features. The entrant is a current student at an accredited institution of higher learning in the state of Arkansas. When completing the submission form, you will be asked for an email address ending in “.edu”, this is how we will verify your enrollment. Failure to include such an email will automatically disqualify your submission. The artwork cannot have been previously published. The winning artwork becomes the sole property of ARID. ARID may ask the winner to make revisions to the submitted materials. In order to be eligible to receive the award, the artist must be agreeable to this. A winning entrant agrees that ARID shall have the exclusive right to reproduce the artwork on its website and printed materials, which may be distributed at no charge or be sold for a fee that will be retained by ARID. The winning entrant will be credited where possible on Conference materials. By entering this contest the entrant agrees to all terms set forth in this form. The artist who creates the winning logo will receive a check in the amount of $150. There are no other awards. The winner will be announced by no later than June 15, 2016 and payment rendered to the winning party no later than June 30, 2016. Feel free to take a look at previous materials linked below, but do not hesitate to design in a different style for this competition. Our goal with sharing these is to give you an idea of how the two documents can play off of one another, not to limit your design options. You are welcome to include or exclude text regarding the conference.